This special table is made using reclaimed pine as its surface with hot rolled steel legs that are powder coated. 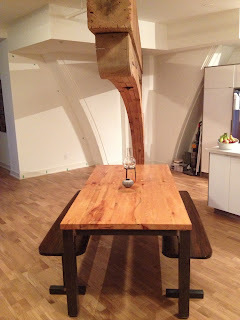 What is really unique is that the wood used for the table top is the same wood as the beam above it. The Victoria Lofts, formally the Victoria Royce Presbyterian church use to contain hundreds of square feet of pine beams. The wood was removed and replaced with concrete and steel. Much of that wood was repurposed into furniture products from Forever Interiors. Much is in the homes of people across the city, this piece did travel far as it is home in the very building from which it came. Pictured above is our Modern metal Harvest table. Available in many sizes and one just right for you.